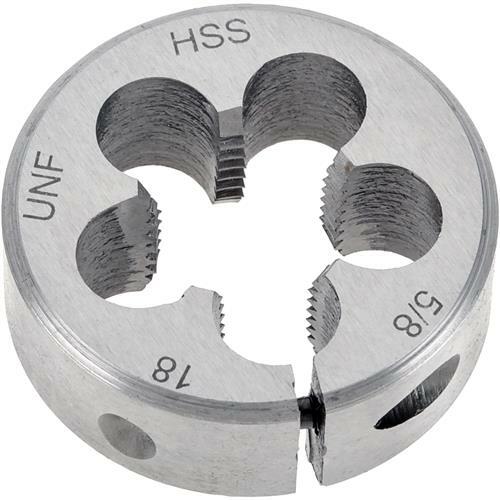 HSS Round Adjustable Split Die - 5/8"-18 x 1-1/2"
Grizzly G6955 - HSS Round Adjustable Split Die - 5/8"-18 x 1-1/2"
These right-hand fractional and machine screw adjustable split dies give you the flexibility you demand. Screw adjustable. Type: 5/8"-18 x 1-1/2"
Had to really struggle to use this die. It required a large taper at the end of the 5/8" shaft I was threading to get a good bite. Even after starting the threads it was tough sledding and required 2 passes with the first open all the way and the second tightened down a bit to finish the threads. Never had a die out of the box seem like the teeth were dull and ready for the trash as much as this. Yes, it did cut but I wonder about the quality. I guess for 9 bucks I get what I paid for!